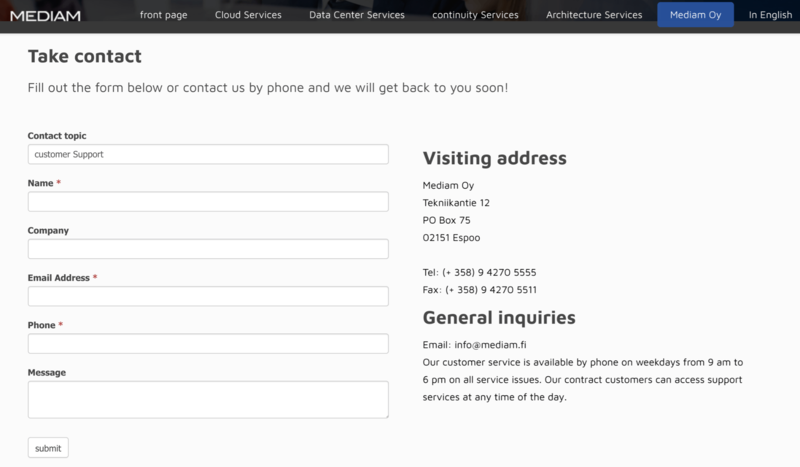 Mediam Review 2019: Is Mediam a Good Hosting? Founded in 1997, Mediam Oy is a Finnish I.T. company that offers managed cloud hosting solutions, dedicated servers, and architecture services to entrepreneurs, medium-sized businesses, and international corporations. Mediam Oy (or simply Mediam) is a Finnish I.T. company that was founded in 1997. It uses top-notch infrastructure to provide high-quality cloud hosting and dedicated storage backed by great customer service. One of the things I love about Mediam is that it actively monitors and manages all its services and products, which means you can just sit back and enjoy your hosting. It does daily automatic backups of your files and databases, which gives you a fallback in case of a data disaster. As well as backcps, snapshots are also available so you can restore previous configurations exactly. Mediam’s cloud services are guaranteed by a combination of technical, physical, and administrative measures. This provider’s servers, located in secure facilities, were built for speed, security, and flexibility, and they are well-protected against external threats and exploitation. Besides deploying firewalls and anti-attack systems, Mediam also conducts automatic vulnerability checks. Data related to security is processed through a foolproof backup network. Mediam has a clear and cost-effective pricing model. Customers who opt for traditional storage are charged a fixed cost whereas those who opt for the virtual data center pay on demand. All cloud hosting and storage services are rigorously tested to make them as risk-free as possible. New users are provided with detailed instructions on the basic setup and configuration of the different parts of their hosting, and the Mediam website also includes a technical bulletin to help you plan around its scheduled maintenance. You can contact this company by email, telephone or online form: between 9.00am and 6.00pm on weekdays for general enquiries, and at any time for current customers. When I reached out to the customer support team by telephone, I was surprised by how fast and knowledgeable they were with their responses. Mediam is a local Finnish I.T. company with a global outlook. It’s a good choice for anyone who wants dedicated servers or high-performance cloud hosting with scalable network capacity. Wondering how Mediam stacks up against other Web Hosting companies? Enter any other Web Hosting company and we will give you a side-by-side comparison.